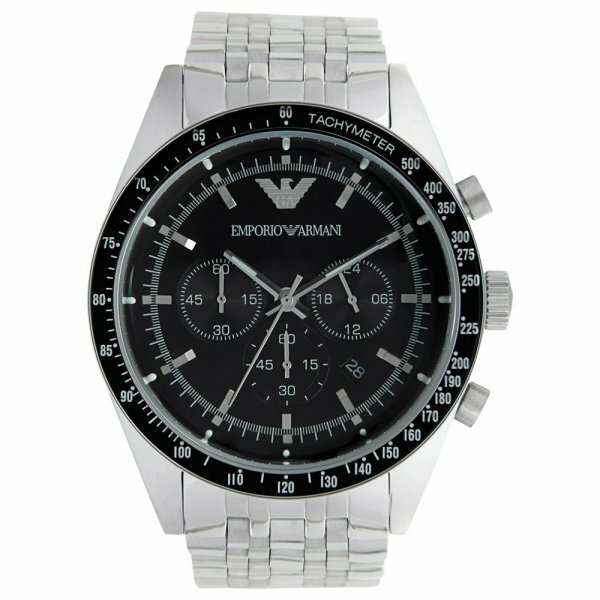 Emporio Armani Mens Silver Tazio Classic Watch AR5988. The Emporio Armani gents silver watch AR5988 is a luxurious timepiece from the mens Emporio Armani Classic Collection. This chronograph silver tazio watch features a desirable silver stainless steel strap, chronograph display, black dial and water resistance up to 50 metres. The mens Armani AR5988 watch boasts attention to detail and luxurious quality and design.The Armani Watch AR5988 also comes in an Emporio Armani presentation case with a two year tic watches warranty. Very nice watch, my husbands fave. However, one of the buttons on the watch did break off and had to be sent to Fossil to be repaired which has cost almost as much as the watch.